For most of the last decade, the carriers have called the shots. Likened to “Soviet ministries” by Walt Mossberg, carriers had full control of their environment, from billing to customer service to device availability. There were four carriers and each competed on different platforms but generally handset manufacturers went to them, hat in hand, and showed off a crop of new devices. Like mad Caligula, the carriers would nod or give the thumbs down and go back to charging us $10 for texts overseas. The groveling, in many cases, was quite unbecoming of international CE firms but grovel they did, asking that their feature phones be given access to America’s lucrative cellular market. The iPhone was the first phone to turn the tables on the carriers. Before, the carrier chose the phones. Now the manufacturer chose the carrier. Although rumor had it that Apple was about to stop by Verizon before it hit AT&T, in reality AT&T was the only carrier amenable enough to Apple’s seemingly draconian demands: control over distribution, supply, and support, control over the app and music store, and absolute control over release dates. Heck, many at AT&T didn’t even have or see the new devices before they were launched, thereby allowing Apple the run of their press cycle. AT&T, in short, was completely at Apple’s mercy – until Apple defected and moved to Verizon. It’s now four years on and the mobile landscape has changed wildly. Carriers that once not only named the players but called the plays are now diminished in authority. Verizon is beholden to manufacturers to continue their Droid hegemony (and, most recently, their access to the iPhone) and T-Mobile is no more, swallowed up by the only GSM carrier in the US to sell the iPhone. Why? Because without a blockbuster phone, T-Mo was stuck and without bargaining power they’ll never get a blockbuster. The result, then, is a merging of the only two GSM carriers in the US, a major step for the technology and both companies. Then Sprint and Google teamed up to supply Google Voice service to all Sprint customers. That’s right – instead of trying to jam home service down our throats, Sprint has given up. They’ve offloaded most of the calling features to Google and instead act as a carrier to Google’s traffic and assume that you’ll reorganize your life along Google’s terms rather than their own. How’s that for rolling up into a corner and whimpering for mercy? The carriers are on the run. They have, for quite a long time, been able to control consumer desire by reducing the availability of smartphones and talking up what amounted to feature phones. However, with the vast majority of – albeit, younger – consumers flocking towards one or two specific phones and sites like this one talking up (or excoriating) lesser Android phones, that status quo is bust. No one wants a garbage handset when there are so many better devices floating around and even bargain hunters can afford an iPhone 3GS at $49. The real money, then, is in selling data in minuscule chunks and even that’s going out of vogue with the rise of ubiquitous Wi-Fi and LTE. To paraphrase Mark Antony (the Roman, not the singer), I have come to jeer at carriers, not to praise them. They’ve held an iron grip on the American telecoms industry for almost twenty years and while Europe enjoyed contract-less connectivity, 3G, and even video calling back in 2001, our carriers sat back selling RAZRs and feeling fat and sassy. With these partnerships, however, our carriers have finally met their match and T-Mobile is the first to fall from their former hubristic heights. I worry, however, that this roll-up will reduce consumer choice and slow the release of new handsets. While for many this may be a welcome thing because there is less of a need to upgrade constantly, I think we will suffer in the end because devices like the Xoom and the Galaxy Tabs just won’t make it to market for fear of low sell-through while the blockbusters prop up the manufacturers bottom lines and add to carriers network congestion. However, I am glad that the carriers are losing the upper hand. They’re still making plenty of money for wildly sub par service they’re still charging us out the jacksy, but they’ve finally met their match and maybe that’s the first step in improving this nation’s telecoms infrastructure. 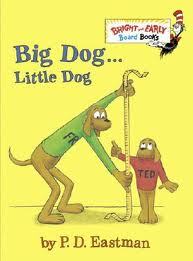 Image from Big Dog Little Dog, which is an excellent book, incidentally, if you’re two.